Milani is a brand that has been on my radar for a few years. It's a difficult brand to find in Canada and so I was never much interested in it. 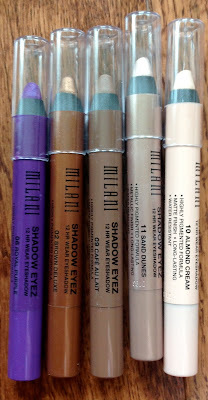 Lately however, Milani has been really stepping up their game and has released a Limited Edition Shadow Eyez collection that's been getting rave reviews, and so I decided to see what all the fuss was about. 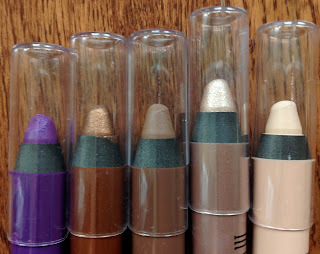 The shades I picked up (in two separate shopping experiences) are Royal Purple, a matte rich medium-dark purple shade; Brown Deluxe, a shimmery bronze with a gold tone to it; Cafe Au Lait, a matte medium neutral brown shade; Sand Dunes, a super shimmery beige-gold; and Almond Cream a matte pale beige. Let me start off by saying that these blow me out of the water! Everything you've heard about them is likely true, except maybe the ability to bring Unicorns to life- the jury is still out on that one. Seriously though these I can see easily becoming a staple for me. 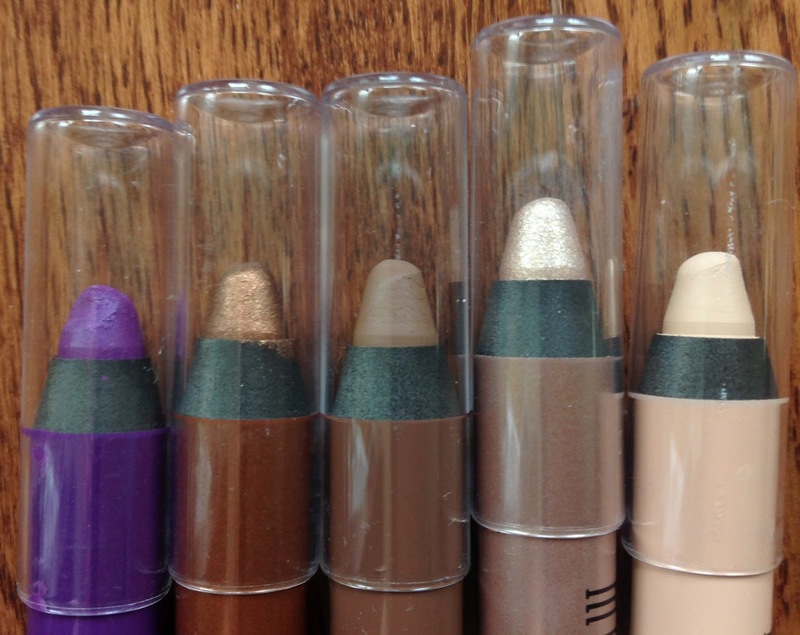 They're creamy and easy to blend with, simple to apply, portable and highly pigmented. Plus once they dry down these do not budge. You can get them wet and they won't smear or rub across them (which I did) and they won't smear once they've set. They also can be applied without any primer straight to your eyelid and it won't crease all day. Just swipe, blend and go. Ahh, the pure simplicity! In function they are much like the Urban Decay 24/7 Glide On Shadow Pencils. In fact they may even be better due to how creamy they start out being and the blendibility of them. Just make sure the little plastic lids are on securely and they'll stay this way too. (Click on any of the photos to make them bigger). Royal Purple applies the patchiest of the shades I own, but it isn't so bad that I won't use it. Just swipe it again and the problem is solved. Sand Dunes as far as I can tell is actually lacking a base pigment at all and is all shimmer- there isn't a matte or metallic base portion to the colour at all as compared to Deluxe Brown. That being said you can barely tell this as the shimmer is so dense it appears like it may be one. Creates a lovely sparkle effect that is almost airy. Very pretty. Deluxe Brown is the best pigmented of the bunch. Not that the others aren't pigmented (they are) but this one seems to apply itself. Smouldery and rich this one makes me this of metal goblets and medieval embroidered gowns. Makes a very easy brown smoky eye. Almond Cream is my favourite (only slightly) because it can be blended to match my skin colour perfectly. Very creamy, very pigmented, it works well as a highlight and to just even my skintone on and around my eyes. Even if you are darker than this shade it will work well as a highlight. Cafe Au Lait is very neutral in it's undertone- it doesn't lean red or yellow. I can see this being a nice staple item for the crease for me as it's not too dark. If this is close to your skin colour I recommend it! To remove these you're going to want to use a good eye make-up remover, water isn't going to work, and soap will work but not well. I recommend finding one that is oil based and made specifically for eye make-up removal so you don't agitate your eyes. 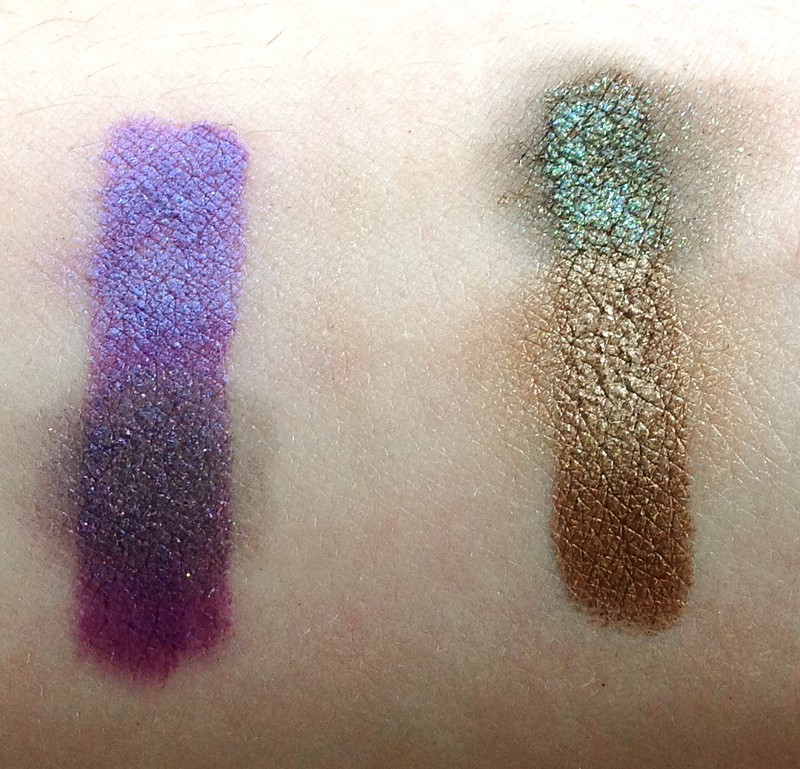 Lastly I wanted to see how these worked as a sticky base for other powder eyeshadows. I don't know if the crease-free all day feature will still apply with another shadow on top but I wanted to see how they'd look. I had to work a bit quicker than normal but not so fast that I felt too rushed. The results are below. I used a variety of different finishes and pigmentation-levels in my powder eyeshadows for this. Each line is a different Milani pencil shade with two shadows swatched on top of them with the original pencil colour peaking out the bottom for comparison. 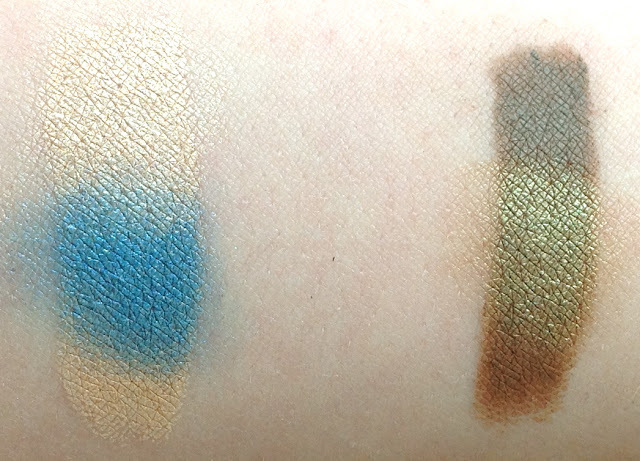 On the left is Almond Cream with Too Faced Satin Sheets over top and Wet n' Wild's Blue Lagoon Color Icon Single in the middle. Satin sheets is usually a light semi-sheer pink with gold duochrome. Blue Lagoon is normally a medium shimmery blue. On the right is Cafe Au Lait with Too Faced Like A Virgin on top with Mac* Sumptuous Olive in the middle. Both stayed true to colour pretty much as Like a Virgin is a matte grey and Sumptuous Olive a shimmery khaki green shade. On the left is Royal Purple with Urban Decay's (old sheerer formula) Asphyxia on top and Too Faced Poison Plum in the middle. Asphyxia is a sheer shimmery lavender with blue reflect. Poison Plum is a charcoal-purple with purple glitter. On the right is Brown Deluxe with Urban Decay's Zodiac on top and Too Faced Push-Up in the middle. Zodiac is a dark sooty green with a massive amount of green glitter, and Push-Up is a Metallic pink-bronze shade. Basically with the darker shades you are going to get some of the base pencil colour showing through, however sometimes this seems to enhance the shades as seen with Cafe Au Lait and Sumptuous Olive, or Asphyxia and Royal Purple. They also hold glitter well eliminating the need for a separate sticky eye base. I know I plan to rock both Zodiac and Poison Plum (my glittery shades) with these for bases. One thing to take note of though is that to apply the shadows overtop I found you had to pat them into the pencils instead of swiping the powder shadows on. If you swipe the creamy base moves and doesn't work. Overall, I can't say enough good things about these shadow pencils. They're portable, easy to use, last all day and are reasonably priced. 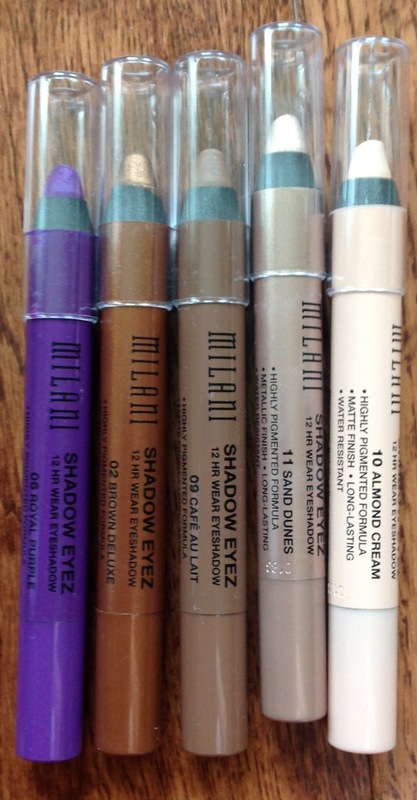 They cost $6.99 on the Milani website. The only real downfall is that some of the shades are limited edition- including my favourite Almond Cream, as well as Cafe Au Lait and Sand Dunes. If you are interested in getting the Limited Edition Shades Click Here. The link isn't sponsored it's just to the Milani website page where I ordered mine from. It's kinda difficult to find on their website for some weird reason. Would I buy it again? Yes. In fact I want another Almond Cream for back-up, and I am eyeing up the other shades too! What about everyone else, have you spotted these before? Do you like pencil shadows? Top items I'll be bringing out for Summer!